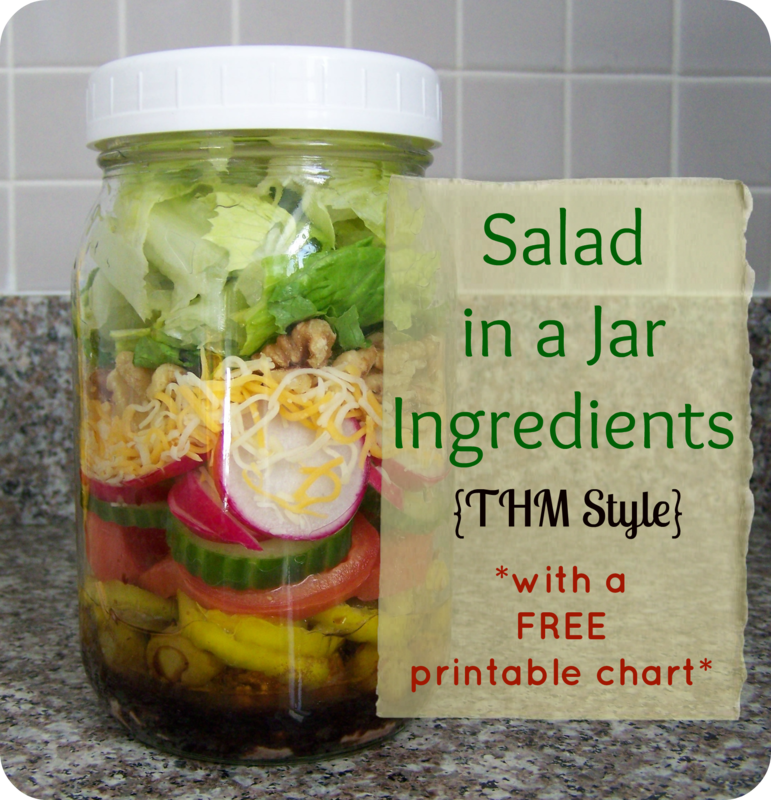 How many of you have seen pins on Pinterest about “salads in a jar”? I have seen quite a few, and we are loving them in our home! They make such quick, easy, filling, and healthy lunches…perfect for a lunch on-the-go or a fast lunch for a busy homeschooling mama. The possibilities are endless when it comes to creating new salads. Ideally, you can make several “salads in a jar” at the beginning of the week and just grab one out of the refrigerator every day. It sure saves a lot of time cutting, slicing, and dividing everything at once instead of doing it each day! For my salads, I put the dressing in the bottom of the jar. My husband likes to add his dressing right before he eats:) Add the more wet ingredients at the bottom so they don’t get everything else slimy. Layer your ingredients, add the lettuce (or put that in a separate container…again, the preference of my husband! ), close the jars, and you are done! For all of you Trim Healthy Mamas out there I have created a printable list of ingredients for these salads based on each meal type. It makes for a nice reference when you are throwing a salad together, even if it isn’t in a jar! Just click the link below to print off one of your own. Even during the cold winter months, these salads are perfect with a steaming cup of hot soup. I would love to see some of your salad creations! Do you have any other ingredients you enjoy on salads? 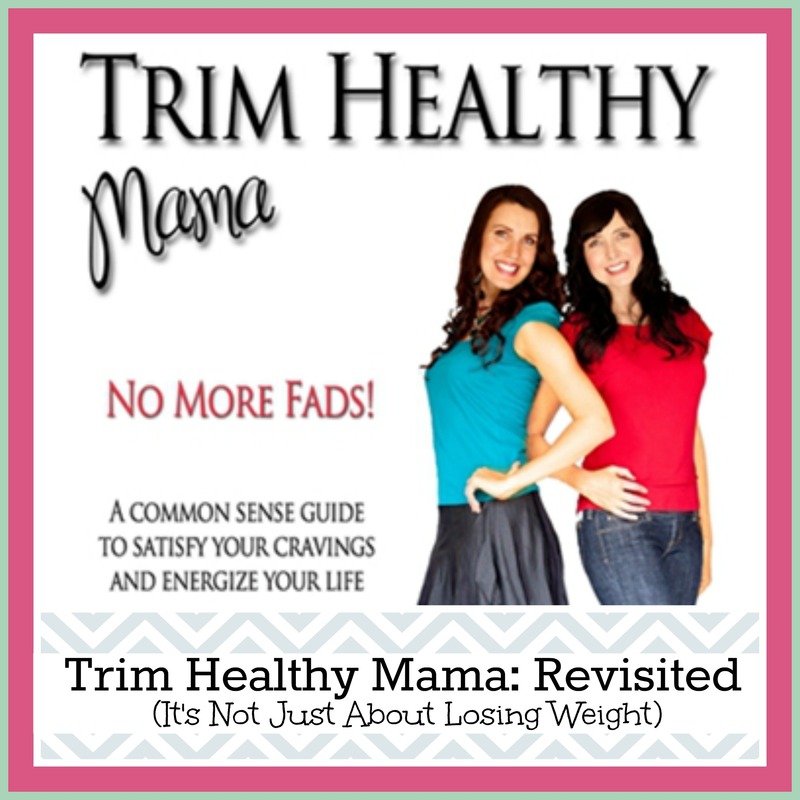 It has been almost 4 months since I first published my review of Trim Healthy Mama. I would love to tell you that I have lost tons of weight and am perfect healthy, but that is not the case. And it has nothing to do with the program. It really has everything to do with me. Eating for me is such a delicate balance. Unlike many other addictions, you can’t just stop eating. But at the same time I can’t spend all of my time thinking about food…then we run into idolatry. The one thing I have discovered recently is that my body does not well eating junk. It also does not do well without healthy carbs. I had been on a paleo-ish diet for over a year when my weight loss started to stall. My energy levels dropped too. I just wasn’t doing well. I didn’t feel great anymore and I used too much coffee just to get me through the day. Every part of my life was suffering since I just didn’t have enough energy for doing anything well. 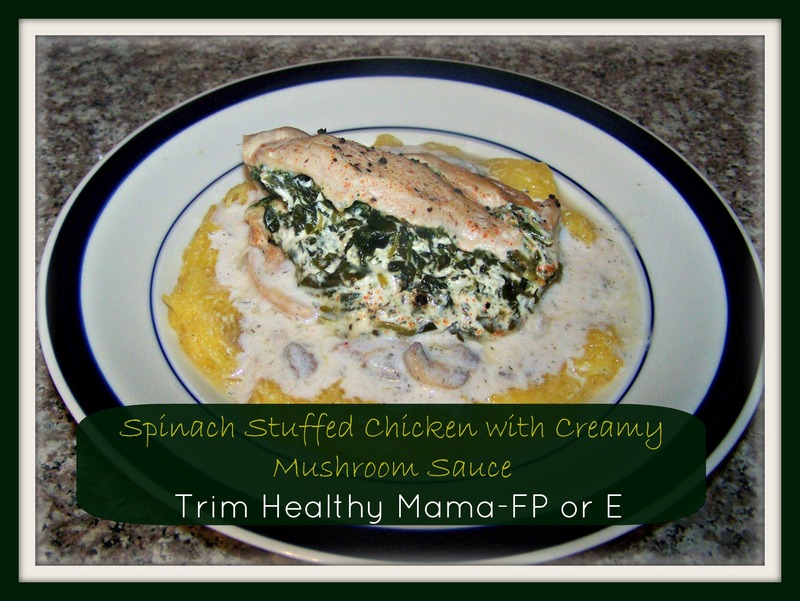 Then I was introduced to Trim Healthy Mama. My first month was very successful and I lost 6 pounds! But then things stalled and I gained the weight back. My perfectionist personality was telling me that it must not work. But there was much more to the story. I spent a couple of weeks eating whatever I wanted, which brought me back to my mostly paleo diet. Then my energy crashed big time, again. I came to one very important conclusion…good health is so much more important than losing the 15-20 pounds I wanted to lose. I spent some time reading the questions people were asking on the Trim Healthy Mama Facebook group, and I also read through the book again. I figured out the problem. I was not eating the carbs that were necessary to rev up my metabolism again. My body had been so deprived of them for so long that every time I ate anything with carbs it held onto it…hence not losing weight. Now I just needed to come up with a plan of eating more meals with healthy carbs on a regular basis, and boy has it made a difference! I no longer walk around in the fog I used to be in. I no longer get random dizzy spells throughout the day. My skin is clear and soft. I have the energy to exercise now and can even make it through the day without either a nap or 5 cups of coffee! I am truly feeling great, and that is better than any weight loss. I know that will come in time once my body is healed from carb deprivation (I have lost 5 pounds and several inches on my first Fuel Cycle! ), but for now I am just enjoying feeling good, eating nourishing foods, and returned to my energetic self! 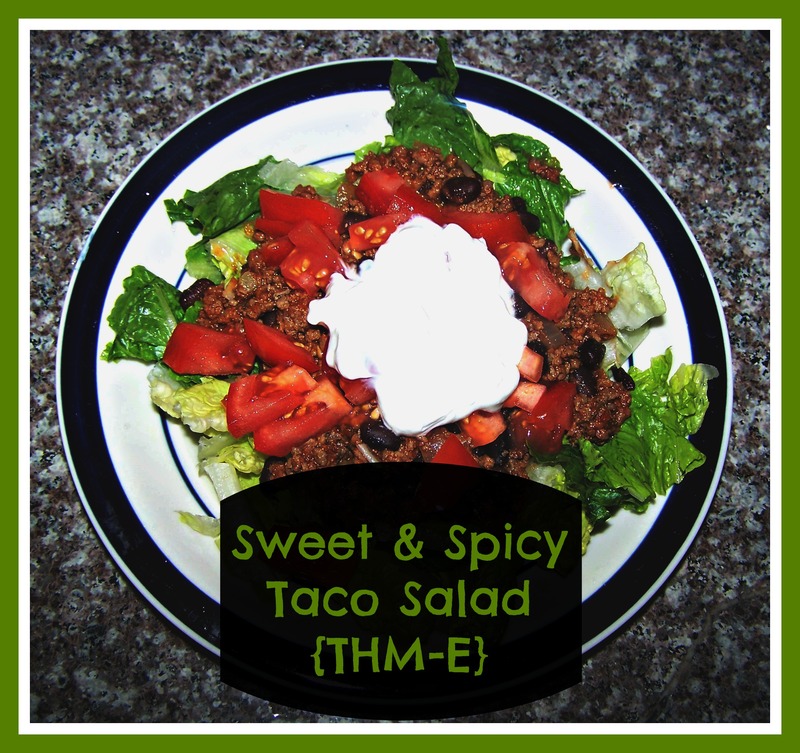 I know that Taco Salad can often be made with fatty ingredients (perfect for a Trim Healthy Mama S meal). But this one will be a little bit different. The recipe was inspired by one from my good friend that included Catalina dressing. It is so good! Want to give it a try? Here are the ingredients needed. To prepare the salad, brown the meat with the onions and garlic on medium heat (unless you will need to rinse the meat…then you will need to brown them separately using just a little bit of oil). Add the following ingredients: tomato sauce, ACV, sweetener, salt, cilantro, cumin, chili powder, paprika, and cayenne. Then add in the beans. This mixture needs to simmer a bit to thicken up (about 20-30 minutes). If you need to serve it right away you can try adding about 1/2 tsp. of glucomannan powder (sprinkle it in while mixing…don’t dump it in). Well, after a little break, I am back into Trim Healthy Mama mode. I will write a little bit more next week about what brought me here, but for now I am going to share with you what we had for dinner last night. Right now I am in the middle of a Fuel Cycle, and last night was a Fuel Pull day (which means low-carb and low-fat). It can be tricky coming up with meal choices for these days, so I decided to come up with one of my own! 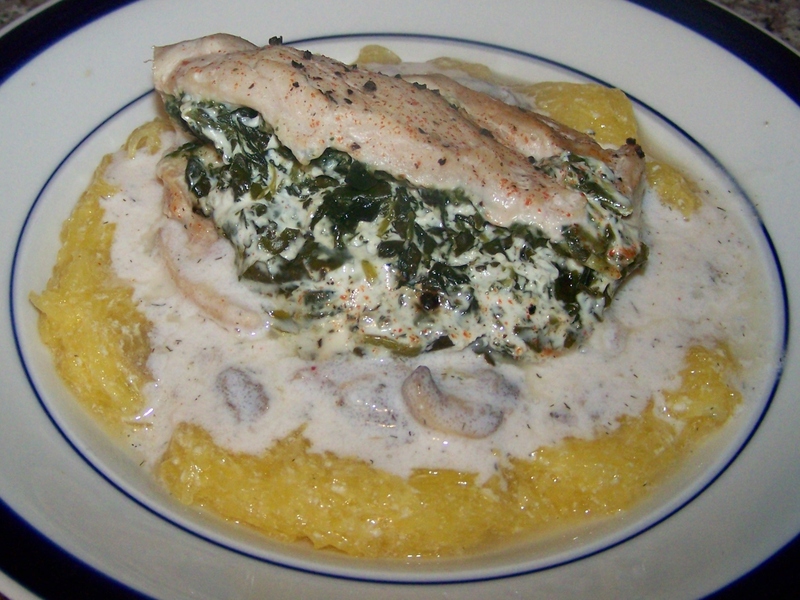 If you are using spaghetti squash, start cooking it. Another FP option would be cauliflower rice, which would also need to start cooking. Preheat oven to 350 degrees. Butterfly each chicken breast, leaving room for the filling. The other option is to pound it until it is thin, but that is too much work for me! Now get the filling started. In a small bowl, mix the 1 C. spinach (thawed and drained) with 1/2 cup plain Greek yogurt (if your yogurt is really thick you may want to add a little broth). Add in your spices: I used 1 t. salt, 1/2 t. fresh pepper, and a pinch of cayenne. Feel free to use whatever your family will enjoy. Pour a couple of tablespoons of broth in the bottom of your baking dish (mine was an 8×8 glass dish). This keeps the chicken from sticking. Now stuff that chicken! 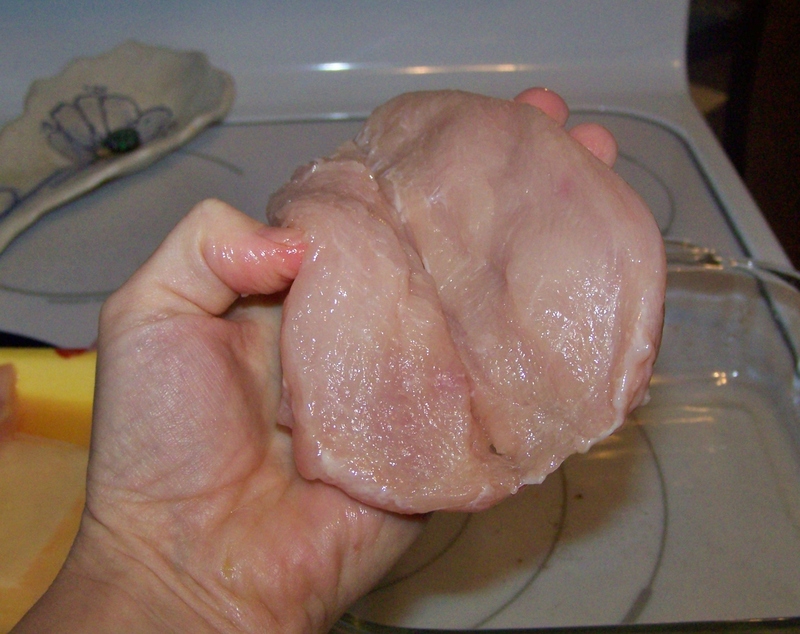 Lay the chicken pieces in the pan and cover it with foil. 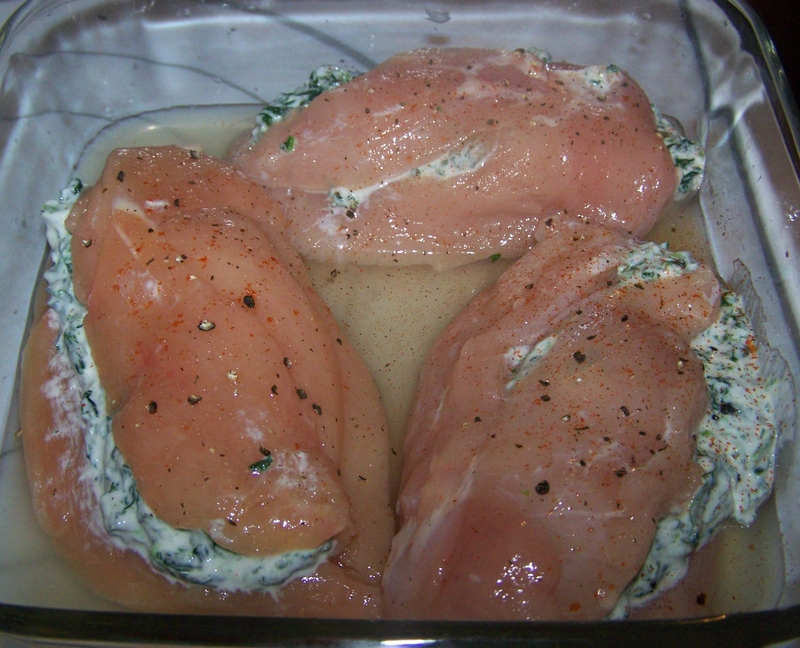 Bake for about 30-45 minutes (depending on how thick your chicken is). While the chicken is cooking, it is time to make the creamy sauce. In a small sauce pan, mix 1/2 cup chicken broth with 1/2 cup Greek yogurt. Add in your spices. I used 1 t. salt, 1/2 t. pepper, 1/2 t. dill, and a tiny pinch of cayenne (you could also use paprika if you don’t want it too spicy). Add in 1/2 t. Glucomannan Powder , whisking until mixed. Simmer this on a low heat just until it warms and starts to thicken. Don’t let it cook too long or the yogurt will separate! Add in 1 small can of mushrooms. Once the chicken is done, simply layer your spaghetti squash (or cauliflower rice), then add the creamy mushroom sauce, and top it with your chicken. Yummy, creamy, and a fuel pull! To make this an E you could easily put this over either quinoa or brown rice. This is the beginning of what will hopefully be a lot of easy and delicious recipes to help you eat a little better and love the food you eat. Don’t miss any new recipes…you can subscribe to our blog by email, follow us on Facebook, or follow us on Twitter.